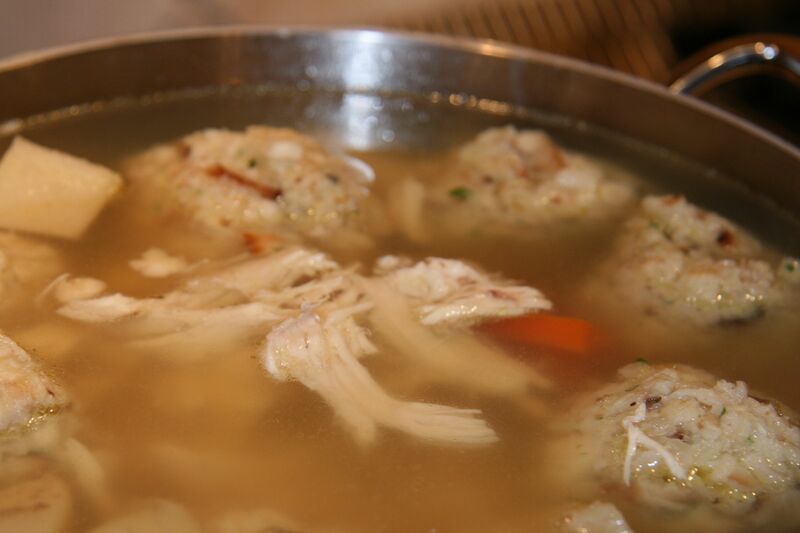 Here it is, a long time in coming and just in time for Passover — our Matzoh Ball Soup episode; which happens to be our first foray into some Jewish fare. There are very few Jewish dishes that the general public know (or like), except for MBS. This recipe I borrowed online a few years ago and is different from the traditional white globes you get from diners, Jewish delis or old Bubbe (grandma). There were a few things skimped out on during the video: if your balls don’t float after dipping them in the boiling water (ouch! ), then you need to lighten up the mix with a little more egg. Alternatively, if its too mushy when you taste it then add a little extra matzoh meal. Also, I like adding a teaspoon of paprika to the broth to get a little more color and twang to the soup. Between the turmeric and the paprika it makes it a nice orangey tint. A mystery that continues to go unanswered – how should you spell matzoh? I’ve seen it with the ‘h’, without the ‘h’, with an ‘a’…hey Vanna, can I buy a vowel? Yes, I still touch my face occasionally and the production quality is getting a little better except for the honkin’ umbrella light reflected right in the middle of the action. Sorry Mr. F, I should have paid more attention during your video tutelage!